Let’s keep this plain and simple. Every Saturday and Sunday from May to Halloween (roughly), the most diverse, authentic, affordable, and delicious gathering of Latin American street food vendors takes place at the corner of Clinton Street & Bay Street at the Red Hook Ball Fields in Red Hook, Brooklyn. Mexican, Dominican, El Salvadoran, Colombian, Chilean, Guatemalan. 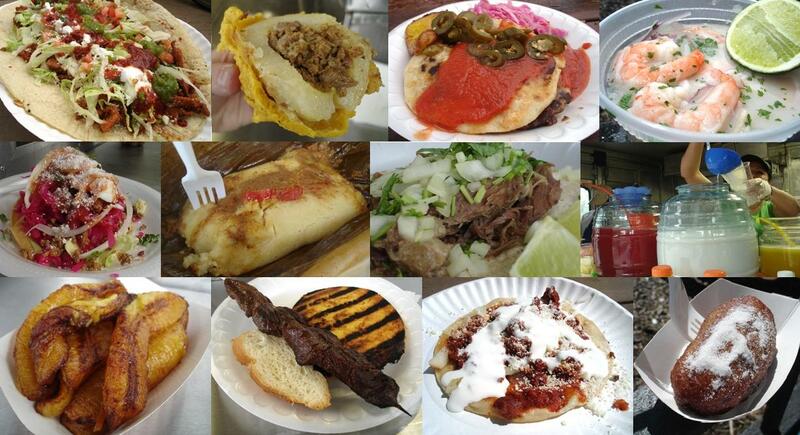 It’s all represented with pride, love and the BEST LATIN AMERICAN FOOD NYC Food Guy has ever tasted What’s more? Nothing is over $10. Once you arrive, however, it’s an overwhelming experience: so much delicious food and so little English spoken by some of the vendors. Trust me when I tell you, if you like Latin American food and you’re willing to try new things, this experience will change your life. Email me: [email protected] if you have any questions or concerns. Read on for information on how to get to the Red Hook Ball Fields plus other essential information. Saturdays & Sundays from around 11AM until 8PM, as long as people are still out there buying food. As of now, there’s no rain information line. Just assume if you wouldn’t want to be out there, they probably wouldn’t either, although it’s a good bet they have a little more of a threshold for the rain than you do. If it just looks like it may rain, however, that will not stop the vendors. 1) Take the F train to Smith-9th Street and walk to the Ball Fields, outlined in the map below. Lately there have been some service issues and to get around them, you’ll take the F Train to the G Train’s Hoyt Street-Schermerhorn Street stop, the third stop from Manhattan, and transfer to the G Train there, which will take you to the Smith-9th Street Stop. You will hear announcements about this on the F Train. 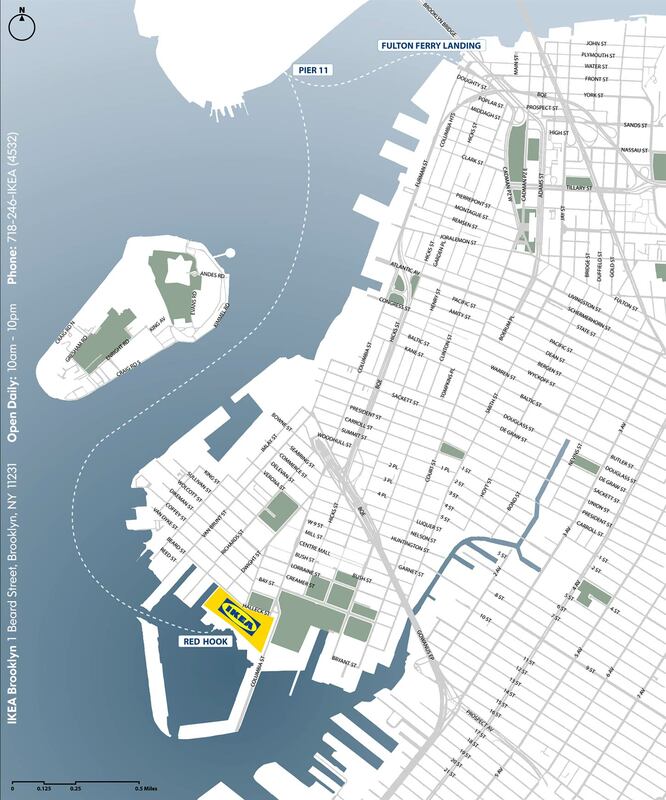 2) The free IKEA Water Taxi which departs daily from Pier 11 (below) near Wall Street. 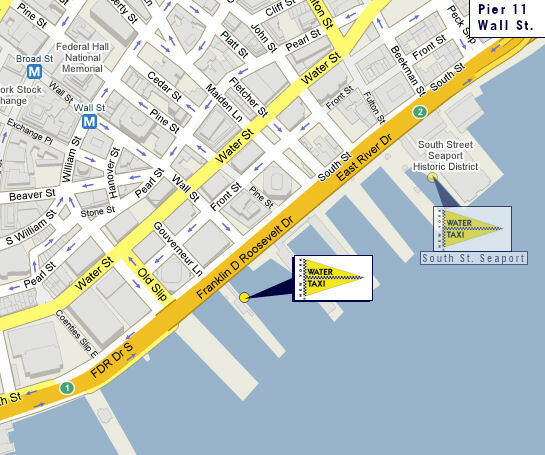 Here’s the information from the Water Taxi’s Website. Here’s the information from Ikea’s Website. Below you’ll see the route from Pier 11 to IKEA’s Red Hook pier. 1) Take the G Train to Smith-9th Street. Here’s the stops on the G Line. Food guy this is pure genius. You have really kicked up the site a notch. Latin Food and cheap shopping at IKEA can’t be beat, plus it’s easy to get there from downtown via the ferry. Thanks for doing the legwork and making it easy for us. I am an out of towner (I am from DC) and before any trip to NYC I always rummage through your site to see what spots I need to hit. I wish we had something like this down in DC (I would start it, but just don’t have the time). men do I like your web….and I live in Spain!!! am I crazy or what!!! my brother lives there and Im probably going to NY later on this year…maybe sept or october, I would love to try this great latin style gathering…. This is an excellent find! Thank you so much. I love some good latin food. We’ve only tried the pupusas there, but they were AMAZING! So we’d appreciate any and all tips on what else to try. I’m only familiar with Mexican and Salvadorean food. Will you be posting the names of the dishes in Spanish? Do they have huaraches? 3) The grilled corn lady – they grill the corn, cover it with butter and parmesan cheese. PS – you can also catch the free Ikea bus in Brooklyn at Borough Hall. So, if you don’t feel like taking a taxi, take the 2,3,4 or 5 train to Bourough Hall and then as soon as you exit, there is an Ikea bus stop. The bus runs every 20 minutes. When I lived in the area, I used to plan to my visits to the post office, located at, believe it or not, the corner of Clinton and Bush, to coincide with a visit to the food vendors in Red Hook. One modest vendor served the best cut-beefsteak, soft shell tacos in Brooklyn. At the time, two tacos and a soda cost $5. YES! you finally got the recent comments back up on the top right, THANK YOU! Way to go NYCFoodguy! And now, on behalf of all your devoted but veggie followers, find us some veggie ball park food. Pretty please with a strawberry lime mojito on top! Thanks for the kind words man, it’s good to hear from you. It’s been a while. How’s everything going down there? I’m going to have to give you a shout when I’m going down to DC. You’re more than welcome miguel. Give me a shout when you come back to the US. Thanks, great to hear from you. Have you been out here yet? You’re very welcome. You need to get out there and sample the goods yourself now! Let us know what you like best. Well the pupusas are a great start but you’ve got a lot of work to do. Keep coming back to NYCFoodGuy.com because I’ll be posting plenty about all the delicious dishes at Red Hook. Getting out of Manhattan alot. Thanks puff, for the knowledge and the kind words. Let’s meet up out there. You are a smart person to plan trips around Red Hook. We’re going to have to figure out which taco you were talking about! Tell us more about it. It won’t be easy but I will do my best! Any recommendations? Thanks for the map man. I’m making my pilgrimage very soon. You got it man. Red Hook is the real deal. You need to get out there ASAP. If you have any questions feel free to email me: [email protected] or just leave some comments here. Thanks for the great maps! Foodguy, I’m from out of town and really appreciate the info and maps. Visiting the Red Hook Vendors has been on my to-do list for a while. Any idea what their July 4th holiday schedule is likely to be? For instance, would they open on July 3rd (Friday) since it’s a holiday. Thanks again!!! I spoke with the head of the Vendor’s committee and he said they will have regular hours the weekend of July 4th and will not be open on July 3rd. How late in the season are the vendor’s at the Red Hook Ball Fields? I’m trying to plan a visit for some great food and am curious what type of schedule I’m looking at. This information is the best. I cant wait to get some good eats and take in some futbol!! Same question as Vivian…how long does the vendor season run. I was looking to venture down in early October? Also, can someone fill me in on the futbol schedule?? Do they play every Sat & Sunday, and what time??? Traveling from PA, so I want to make a day of it. Lastly, any other suggestions on activities in the area? Do not eat at red hook ball fields the food is dirty you will get sick.These people have no city permits,pay no taxes and are all Illegal aliens.Seriously the city doesn’t have inspectors at the site,you will get sick guarantee. Jose, perhaps you’ve had one bad experience at the ball fields, but I’ve enjoyed food there at least a dozen times over the last 5 years and have not once fallen ill. Oh, and they actually do have city permits and have to pass DOH inspections. I’m not sure where you’re getting your information. thanks for the detail and directions, im gonna check it out next saturday! excited! I grew up in Red Hook, in the 60’s and the beginning of the 70s’, 466 Columbia Street, my cousins lived at 124 Bush Street. jose sounds like someone who wants to keep the lazy manhattanites and Gringos out of his ‘hood! Which is a smart idea haha! I mean really, anyone with a brain can find all sorts of articles detailing the fight and money involved in forcing all the vendors to get permits that are up to code. there really isn’t anything logical or reasonable that can be said against such an obviously ridiculous claim. Not to mention how F-ing good some of the food is. The Barbacoa is the best I’ve had anywhere in the US. I am from LA, lived in SF, eaten in Sunset Park, Spanish Harlem, Queens Roosevelt actin, you name it, from the Mexican truck that is the furthest South on the far side of the fields, it is simultaneously crisped on the edges, gamey, fatty, meaty! OMG, drizzled with salsa verde and a few bites of Chicarron and carrots pickled with jalapenos… it’s like being back in DF! Orale! You people don’t want to listen to me that’s ok.How can you trust illegal alien food?These people come from very poor towns back in mejico,these people don’t even have toilets in their homes.Do you know they keep their food past the expiration date in order to save food cost.They don’t wash their hands,don’t take my word just observe them when you order your nasty tacos.People open your eyes mejicans people are very dirty people you will get sick from eating these nasty foods. I will save my Fairway trips for the weekend now! I just like to look! Jose el matron, you may be on to something here! Cleanliness, handling, storage and temperature and quality of food is kept is very important to my stomach. Do these vendors have certificates of Food Safety by The Dept. of Health? Great spread, a cuisine(s), one you make irresistible. I think the next cool dry weekend, I’m there. In the meantime, what are the good trucks or stands in Manhattan? Also, how do you answer questions like the one sent by “Big Daddy Cool”? Just wondering if the NYC Food Guy got around to answering my question about Health and Food Safety. I also read in the Brooklyn Paper that the people living in this area are complaining about more rodents lurking around because of this.